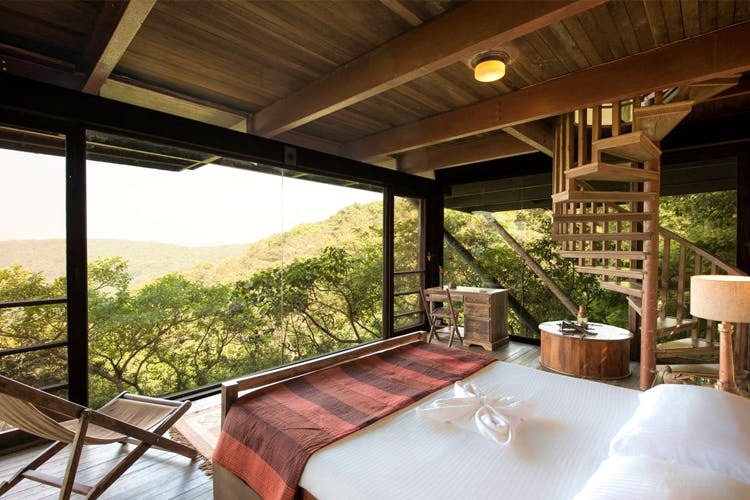 The Machan, located two and a half hours away from Mumbai, is an eco-resort which offers a range of unique tree houses situated up to 40 feet above the forest canopy, allowing for great views and cool weather. The Machan is located in Jambulne, one of the 25 biological hotspots in the world. What we love about this resort is the up-in-the-air vibe of staying here. The tree houses are secluded and beautifully done up with hardwood floors and large windows that allow the fog to literally enter your room. The view is sheer greenery as far as the eye can see, with not a man-made structure in sight. Heritage, Canopy, Forest, Jungle Sunset and Cabin are their tree house options. If you’re worried about the insects, don’t be; we were pleasantly surprised to find the rooms completely clean and bug-free, complete with a bottle of Hit in the bathroom for unexpected visitors. The rooms also have air-conditioning, but if you’re like us, you might prefer to spend more time on the rooms’ decks for the view. The meals are home-made and reasonably priced, and have many options for vegetarians. They’re a little on the expensive side, so it would be ideal if you’re heading out in a large group or to celebrate a special occasion. The resort offers daily yoga classes, forest tours, documentary screenings, trekking, and will even set up a bonfire for you on a particularly chilly night. We recommend carrying a good pair of sports shoes for getting around, since the ground can get slippery around the monsoons. Also, be warned gadget junkies, there’s no television, mobile network or Internet.